Not many people know about the Free Library's wonderful collection of Tomi Ungerer papers, currently being processed in the Children's Literature Reseach Collection. But since his birthday is this weekend, now's a good time to learn more! On November 28, 1931, Jean-Thomas (known as Tomi) Ungerer was born in Strasbourg, France. He would grow up to be a painter, cartoonist, sculptor, and award-winning author and illustrator of children’s books. Both his children’s books and his works for adults are notable for their satirical edge, an attitude that may be traced to his childhood in Nazi-occupied France. The occupation had an enduring effect on his worldview, leaving him disillusioned and with a permanent habit of questioning authority. (His high school headmaster described him as a “willfully perverse and subversive individualist.”) After dropping out of school, Ungerer hitchhiked across Europe and briefly joined the French Camel Corps in Algeria. He then attended the École des Arts Decoratifs from 1953-1954 before resuming his travels, arriving in New York in 1956 with just $60 and a trunk full of manuscripts and drawings. There he quickly found success. Editor Ursula Nordstrom at Harper & Row published his first children’s book, The Mellops Go Flying, in 1957. Many more popular children’s books followed, including Crictor (1958), Emile (1960), The Three Robbers (1962), and Moon Man (1967). These books feature unlikely heroes – a boa constrictor, an octopus, a group of robbers – who prove themselves helpful, courageous, and generous in the face of initial fear and misunderstanding. But in Moon Man, the man in the moon journeys to earth only to be persecuted by intolerant earthlings and must escape back to the moon in rocket ship. As the 1960s went on and Ungerer became increasingly active in the Civil Rights and anti-Vietnam movements, a less optimistic tone pervades his work. Ungerer and his family left the U.S. for Canada in 1970, and settled in Ireland soon after. Before leaving the United States, Ungerer donated many of the manuscripts and artwork for his early children’s books to the Children’s Literature Research Collection at the Free Library of Philadelphia. They are now being catalogued and digitized as part of a CLIR grant. We archivists are lucky enough to see all of the beautiful and wickedly funny artwork in the collection, but we want you to see it too! In the next few weeks, look for the announcement of a new exhibition on the ground floor of the Free Library, featuring some of our favorite pieces. 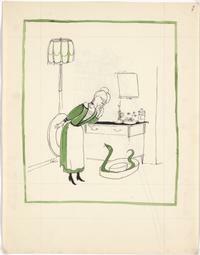 Want more news from the Children’s Literature Research Collection? Visit our Facebook page or follow us on Twitter. 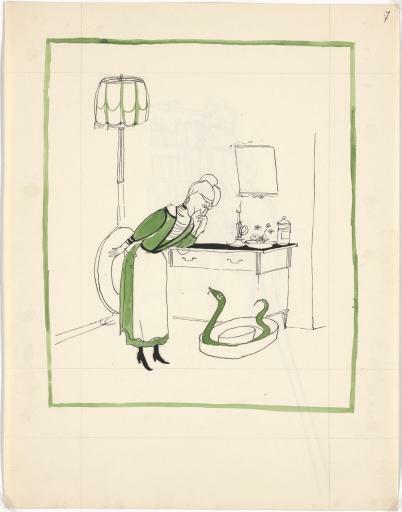 Madame Bodot discovers the boa constrictor her explorer son has sent her for her birthday, in this preliminary sketch for Crictor. The Mellops work on distilling fuel for their plane in The Mellops Go Flying. Although the book was published in only three colors, many of the initial paintings were in full color. 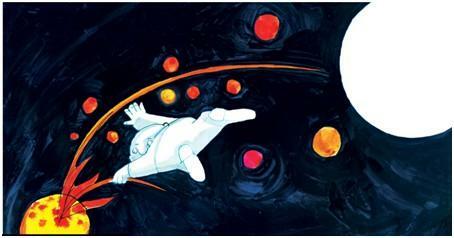 The Moon Man catches a ride on a comet and makes his way to earth.